Raynham Hall was built circa 1738 as a two-story frame house with central brick chimney, gable roof, flush siding of wide boards and a five-bay façade with an entrance in the middle. 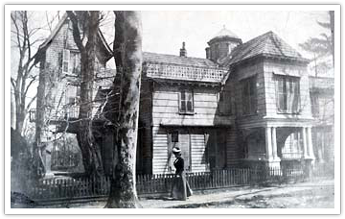 The house contained four rooms, two on each level, with a garret or attic under the roof. The first floor consisted of a “hall” and “parlor” that flanked a narrow passage with a winding staircase built in front of the chimney. On the second floor were two “chambers” that corresponded to the hall and parlor below. Fireplaces opened into all four rooms from the central chimney. Around 1740, Samuel Townsend built a lean-to section on the north side, or rear, of the house. The addition, which increased the number of rooms to eight, included a kitchen and storage room on the first level and chambers above. The shed roof of the lean-to section extended the rear slope of the main gable roof, creating the distinctive “saltbox” outline. Architectural and documentary evidence suggest that at least one of the first-floor rooms featured wall paneling. The original parlor fireplace wall appears to have had paneling that extended from floor to ceiling as well as a decorative mantel and overmantel. The mantel, overmantel and parts of the paneling are today incorporated into one of the restored colonial period rooms. No substantial changes were made to the house during the remainder of the eighteenth century. 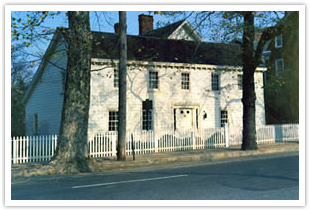 The museum’s collections include a pencil sketch of the house, dating to circa 1800, that shows a one-story porch extending the full breadth of the façade. The porch, which must have been added shortly before 1800, seems to be the only improvement made by the Townsends. The sketch clearly depicts the paneled Dutch door that is in place today and dates back to the mid-18th-century house. 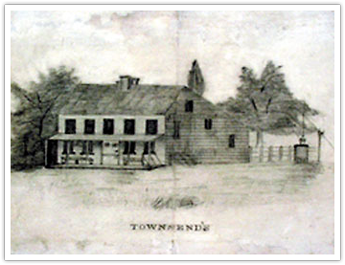 In 1851, Solomon Townsend II, a grandson of Samuel Townsend, purchased the property from his uncle, Dr. Ebenezer Seely. He commissioned his nephew, the architect Edward H. Thorne, to remodel and enlarge the colonial house, which was considered old fashioned by the middle of the 19th century. Thorne created a fashionable Victorian “villa” in the Gothic Revival style. He added a wing with steeply pitched gables, a tower with a porte cochere for carriages to pull under, projecting bay windows and open “piazzas” or porches. The additions doubled the size of the house, resulting in a large, sprawling residence of twenty-two rooms. The porches, projecting bays, multiple gables and window openings of different shapes and sizes gave the villa a picturesque quality that appealed to romantic Victorian tastes. The extensive remodeling of the original colonial house included French windows on the first floor, a deep front entrance porch with a projecting bay above, new siding of clapboards on the first floor and shingles on the second floor, and a balustrade at the edge of the roof. The central chimney of the circa 1738 house was removed and replaced by an octagonal lantern that provided illumination for an octagonal stained-glass skylight installed in the ceiling of the second-floor hall. From the first-floor hall, the skylight was visible through an elliptical opening with cast-iron railing that connected to the second level. Gothic Revival details on the exterior of the house included steep gables, pointed-arch window openings and Tudor arches at the porte cochere. Inside, the style manifested itself in vaulted ceilings, doorways with Tudor arches, and fireplaces with pointed-arch openings. When Raynham Hall was remodeled in the 1850’s, the Gothic Revival style was at the height of popularity, but Victorian tastes were eclectic and the Italianate style was becoming fashionable. Consequently, the house incorporated a number of Italianate features as well, including round-arch window openings, interior molded door surrounds with projecting shoulders, and marble mantelpieces with arched openings surmounted by a shield under the mantelshelf. Around the time of the Civil War, a new kitchen wing was built onto the rear of the north wing of the house. It seems that the Townsend family made no other improvements or alterations after the addition of the new kitchen. The house remained essentially unchanged into the first half of the twentieth century, when it was owned by Julia Weeks Coles and her sister Sally Townsend Coles from 1914 to 1941 and then by the Daughters of the American Revolution from 1941 to 1947. In the early 1950’s, after Raynham Hall had been deeded over to the Town of Oyster Bay and the Friends of Raynham Hall was established, the original colonial house was restored to its c.1740 appearance by the architectural firm of Goodwin & Jaeger. The restoration involved stripping away the Victorian additions at the front of the house such as the tower, octagonal lantern, and deep entrance porch with second-story bay. The architects replaced the Victorian clapboards and shingles with flush siding of narrow boards. The colonial interiors, which had been remodeled in the 1850’s, were recreated using surviving 18th-century woodwork original to the house, mantelpieces and doors from other colonial-era homes, and reproduction architectural elements such as cornices and chair rails. The missing center chimney, however, was not reconstructed. The Victorian north wing and kitchen wing were retained to exhibit the mid-19th-century history of the Townsend family and to provide a caretaker’s apartment. In 1958, the house underwent a second phase of restoration overseen by the architectural firm of Watland & Hopping, who improved the detailing of the colonial wing. The architects removed the Victorian sidelights flanking the Dutch door, added a small entry porch, and replaced the conjectural narrow-board siding with sheathing of wide boards reproduced from a surviving 18th-century example discovered inside a wall cavity. The first- and second-floor rooms in the Victorian north wing were restored and furnished to interpret the mid-19th-century history of Raynham Hall. The 1980s and 1990s witnessed the re-installation of the Colonial and Victorian period rooms to more accurately reflect domestic interiors of the 18th and 19th centuries. The sequence of Victorian period rooms was completed in 1998, when the kitchen and pantry in the 1860s kitchen wing were restored and opened to the public.